The researchers examined more than 6,000 migratory species by taxonomic group (birds, mammals and fishes) and by environmental system (terrestrial, marine or freshwater). 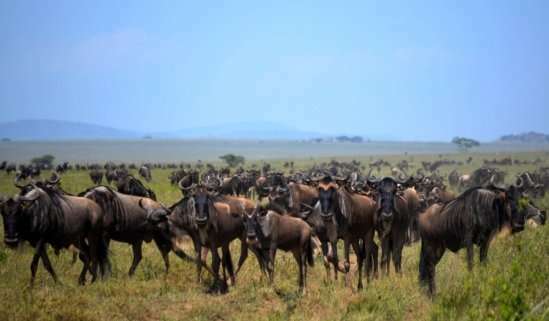 They also determined whether a group's movement exhibited collective behavior—think schools of fish, flocks of geese flying in formation, even herds of wildebeests, all of whom sense cues from their individual members to help guide their collective movement. The team's analysis revealed that while migratory birds are relatively abundant, their numbers are decreasing disproportionately to nonmigratory birds. Take the Arctic tern, the longest-distance migrator, which annually travels 50,000 miles. It is listed as "least concern" by the IUCN because of its large range and abundance of individuals, yet its overall population has been declining for a number of decades. According to Hardesty-Moore, this presents an opportunity for conservation through the implementation of preventive efforts to slow population decline before the species nears extinction. The converse was found to be true for migratory mammals, whose population size is increasing compared to their nonmigratory counterparts. Nonetheless, IUCN lists them as "more endangered." "The relative increase of migratory mammals compared to nonmigratory mammals underscores the success of previous conservation efforts," Hardesty-Moore said. "Still, migratory mammals have an overall high extinction risk because they face so many barriers—roads and development, hunting and poaching—so more work still needs to be done." For example, until recently, the Tibetan antelope was "endangered," but it has rebounded because of rigorous conservation efforts. While their numbers remain fairly low and their ranges are restricted, conservation efforts have been able to increase their populations. "I think that's good news," Hardesty-Moore said. "It shines some light on conservation successes." The scientists also found that migratory freshwater fishes are at greater risk than their marine brethren, which makes sense considering that the avenues of travel available to freshwater species are much more restricted. Dams are a major problem for some of these migrators—there are at least 37,600 hydropower dams in rivers globally, with hundreds more in progress. For example, more than 400 dams limit the migration capability of Chinook salmon in the Columbia River basin. As a result, the species is "highly endangered." Marine migrants, on the other hand, are better able to maneuver around barriers or to skirt fishing pressures. "Our research showed that conservation efforts for migratory species work in certain circumstances, but we also identified regions and groups of animals in trouble," Hardesty-Moore explained. "We were able to pinpoint some of those and highlight areas of interest to conservation biologists. If we want to preserve this fascinating, ecologically meaningful part of life, we will need to find a way to coexist with these species, especially because of increasing human development around the globe."